When Jesus describes the value of the sparrow in Luke 12 and says, “Fear not; you are of more value than many sparrows” (v. 7) is he speaking allegorically? What about when he tells the elaborate parable about the four soils (Matthew 13:1–9, 18–23) or the wheat and the tares (Matthew 13:24–30, 36–43)? The answer will depend on how you define ‘allegory,’ but most will not see Jesus’ comparison with the sparrows as an allegory, even as many do see Jesus parable as incorporating allegorical elements. What makes the difference? And do we rightly read allegory, without allegorizing? A work of literature in which many of the details have a corresponding “other” meaning. The basic technique is symbolism in the sense that a detail in the text stands for something else. Interpreting an allegorical text must not be confused with allegorizing the text. To interpret an allegorical text is to follow the intentions of the author. Allegorizing a text implies attaching symbolic meanings to a text that was not intended by the author to be allegorical. This distinction between between allegorical literature (e.g., The Pilgrim’s Progress) and allegorical methods of interpretation (e.g., Origen’s approach to the Bible) is one of the most confused and confusing aspects of modern evangelical hermeneutics. To be sure, Scripture includes multiple instances of allegory. When Jotham told his story of the bramble who would be king, he used allegory (Judges 9). When Nathan confronted David in his sin with Bathsheba, he employed allegory (2 Samuel 7). When Jesus told his parables he often intended for one element (“the field”) to stand for another (“the world”). This is allegory. Paul even understands the story of Sarah and Hagar (Genesis 16ff) to be written “allegorically” (Galatians 4). In each of these instances, the author’s intent is allegorical. (Except the last example, Galatians 4, is best understood as typological writing in Genesis). Therefore, the extant literature is allegorical, which requires any literal method of interpretation (i.e., one that aims to understand and reproduce the authorial intent) to read the passage “allegorically.” But—and this is where the confusion comes in—in reading the biblical allegory, we must not allegorize the text. And even more, we must not adopt an allegorical method because we find some allegories in Scripture. But this brings us to the text in question (1 Corinthians 9:8–10): Did Paul use an allegorical method in his quotation of Deuteronomy 25:4? And if he is allegorized a passage from the law—a genre not given to allegory—can we do the same? Or did he, like Jesus with the sparrows, make a simple comparison between oxen and men? Or did he do something else entirely? Following the lead of John Calvin, Richard Hays, and others, I will argue that Paul’s use of Deuteronomy 25:4 is (1) logical in its structure (not fanciful), (2) textual (not twisting the original context of Deuteronomy), and (3) theological (specifically, eschatological). But in no way is it allegorical. For starters, we need to see how Paul’s quotation of Deuteronomy 25:4 fits into the logical structure of his argument. Kenneth Bailey likens the shape of 1 Corinthians 9 to that of a “high jump”: verses 1 and 2 provide the approach (the run up), verses 3–9a the ascending jump, verse 9b (the quotation) the peak of the jump, where the athlete crosses the bar, followed by the descent in verses 9c–12a. The inner rings (Arguments #2 and #4) use cultural/vocational illustrations (e.g., soldier, planter, shepherd, plowman, and thresher). The center of the argument (Argument #5) stands on the Old Testament Law, namely Deuteronomy 25:4. From this structure, we find the care with which Paul makes his argument. He is not simply issuing a stream of conscience argument. His logic is precise as he anticipates objections and grounds everything in the words from Moses. For this reason, I don’t believe his “defense” is offering a fanciful reading of Deuteronomy, but a tightly-reasoned, rationale case from the Law itself. In other words, the genre of Paul’s own writing militates against an allegorical reading. If Paul is not allegorizing Moses words, what is he doing? I believe he is reading Moses authorial intent. Consider what Paul says. In 1 Corinthians 9:7, Paul lists three vocations from the culture of Corinth; he will add two more in verse 10. These cultural illustrations show the folly of letting workers benefit from the fruit of their labor, but depriving Paul his due. Apparently, the church which Paul planted should have been sharing its produce with him, but was not. Verses 1–12 attend to this matter, as Paul argues for the apostles right to receive remuneration, even as he will refuse such support when he concludes his argument (vv. 12, 15, 18). Still, in the flow of his argument, he does not depend most heavily on the cultural norms of paying soldiers and letting workers eat of their labors (vv. 7, 10). Rather, he turns to the Old Testament where he finds a passage of Scripture that makes his point for him. In fact, it is a verse he quotes more than once. When tackling the subject of pastors receiving compensation from the flocks they serve in 1 Timothy 5:18, he quotes Deuteronomy 25:4. Why does Paul quote this passage? What does Paul see? The answer becomes fairly obvious when we read the immediate context of Deuteronomy 24:17–25:4. You shall not pervert the justice due to the sojourner or to the fatherless, or take a widow’s garment in pledge, 18 but you shall remember that you were a slave in Egypt and the Lord your God redeemed you from there; therefore I command you to do this. “If there is a dispute between men and they come into court and the judges decide between them, acquitting the innocent and condemning the guilty, 2 then if the guilty man deserves to be beaten, the judge shall cause him to lie down and be beaten in his presence with a number of stripes in proportion to his offense. 3 Forty stripes may be given him, but not more, lest, if one should go on to beat him with more stripes than these, your brother be degraded in your sight. From a cursory reading, we can observe at least three commonalities between Deuteronomy 25:4 (i.e., the oxen verse) and 1 Corinthians 9:10. The setting is that of justice for the oppressed. Many are the commands to ensure foreigners and workers receive their wages (24:19–21). In the same way, Paul is addressing the justice of churches withholding support from those who rightly deserve it. The oxen verse is the final statement in this section. Deuteronomy 25:5 enters a new section, as it turns to levirate marriages. Accordingly, in our English versions, the oxen verse may function as a grounding text at the end of its paragraph. When he says, that God does not take care for oxen, you are not to understand him as meaning to exclude oxen from the care of God’s Providence, inasmuch as he does not overlook even the least sparrow. (Matthew 6:26, and Matthew 10:29.) Nor is it as if he meant to expound that precept allegorically, as some hair-brained spirits take occasion from this to turn everything into allegories. Thus they turn dogs into men, trees into angels, and turn all scripture into a laughing-stock. Paul’s meaning is simple — that, when the Lord enjoins humanity to oxen, he does not do it for the sake of oxen, but rather from a regard to men, on whose account, too, the very oxen were created. That compassion, therefore, towards oxen should be a stimulus to us to stir up to the exercise of humanity among us. Finally, we should note that Paul is doing more than directly applying a principle from the Old Testament to the New Testament church. In historical context, the oxen verse is set in the covenantal context of Israel in the land. Moses writes in Deuteronomy with his eyes set on the Promised Land—literally, he stands on the Plains of Moab preparing Israel to enter the land. In this setting, he instructs the Israelites how they are to treat foreigners and the disenfranchised when they get into the land. He calls them to remember their previous condition (slavery) and God’s gracious work (of salvation), so that they would treat the nations with compassion. From this perspective, we should read 1 Corinthians as a letter that addresses a people who fulfill this promise. No longer is it a future reality that the nations would stream into Zion; through the preaching of the gospel, the nations have come to be a part of God’s new covenant people. In fact, Paul goes further. He explains that what was written by Moses was not just written for Israel, but for those one whom the end of the ages have come. This is his explicit statement in 1 Corinthians 10:11, when he points to Israel and an example preserved in Scripture for the predominately-Gentile Corinthian church. Paul is not just claiming that the biblical verse applies to human laborers in general; rather, “It was indeed written for our sake,” that is, for the sake of the church in Paul’s own time [cf. 1 Corinthians 10:11]. The first person plural pronoun of verse 10 (“written for our sake) has the same implied antecedent as the first person plural pronoun of verse 11: Paul and his associates in ministry. “If we have sown spiritual things among you, is it a big thing if we reap material things among you?” (v. 11). Thus, Paul claims the text addresses the church of his own time directly, in an oracular fashion, metaphorically instructing them to provide financial support for Paul and other apostles. This is for Paul not a derived sense of the text, but its fundamental meaning, now eschatologically disclosed. If Hays is correct about this reading, and I am persuaded he is, then Paul’s use of Deuteronomy 25:4 is both analogical and covenantal, or better it is analogical via the new covenant. In other words, Paul does not merely principalize the Law of Moses, he argues that just as the workers under the law of Moses received material goods, so those laborers of the new covenant (i.e., ministers of the gospel) ought to receive the right to reap from the spiritual truths they sow. This, in fact, is the very way that Paul concludes his argument (vv. 11–12). From this reading of 1 Corinthians 9 we learn two important truths. First, that Paul is in no way offering an allegorical reading of Deuteronomy 25:4, rather his exegetical methods display careful attention to the original context of Moses’ words. Moreover, his awareness of the covenantal changes that have occurred through the person and work of Jesus Christ, cast this Old Testament verse in the context of a new covenant people. This is not an example of ‘allegorical interpretation.’ Paul conceives of Old Testament revelation as a historical unfolding of God’s will for his people. This has immediate application to Israel, but ultimately it also applies to the ‘true’ Israel of the people of God in Christ (who include many Jews who have come to Christian faith). Paul now explains this expression of God’s will for his people’s well-being. Work conditions are not to crush the human spirit, but to lift and to encourage it with thoughts of the benefits of the goal of labor. Hence plowing should take place in hope (v. 10). Instead of giving us a model of allegorical exegesis to avoid, Paul provides an exemplary form of theological interpretation that we should imitate. Additionally, and this is the final point, Paul reminds us the identity of the Corinthian church and all Christian churches are neither a religious continuation of Israel, nor a replacement. Rather, springing from Christ, the true Israel, every church is a third race, a people called out from Israel and the nations to be united to Christ by their faith in the gospel (cf. 1 Corinthians 10:32). 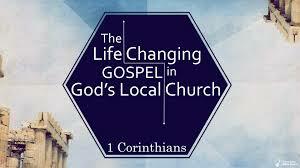 God created the the multi-ethnic Corinthian church when the gospel came to them through the apostolic ministry of Paul, and now as a new covenant community of faith they are called to provide for the gospel ministers that God gives to them. Just as the nation of Israel funded the Levites to serve in the temple, so local churches are called to provide for the bread and board of those who preach the gospel to them. In this way, the instruction to “not muzzle the ox” is one more way in which God calls churches to see themselves in covenant with God and in covenant with one another—analogous to Israel of old. Indeed, what is at stake in 1 Corinthians 9 is not just a case of rightly labeling Paul’s methodology; it is an understanding of who the church of Jesus Christ is. Thankfully, from a careful study of Paul’s approach we learn how he read the Old Testament and applied to Christ’s New Testament people. May we continue to study his words and imitates his ways. “Glossary of Literary Terms and Genres” in The Literary Study Bible (ed. Leland Ryken and Philip Ryken; Wheaton, IL: Crossway, 2007), 1883. For a fine treatment of the way in which Paul interpreted Sarah and Hagar, see Ardel Caneday, “Covenant Lineage Allegorically Prefigured: ‘Which Things Are Written Allegorically’ (Galatians 4:21-31),” Southern Baptist Journal of Theology 14 (2000): 50–77. He makes the same distinction being made here: allegorical literature should be interpreted according to the allegorical intentions of the author; allegorizing, as a hermeneutical method, should be abandoned and opposed, as it reads into the text elements from outside the Bible. Kenneth E. Bailey, Paul Through Mediterranean Eyes: Cultural Studies in 1 Corinthians (Downers Grove, IL: IVP Academic, 2011), 242. “The purpose clearly was not only to provide for the ox itself but to make the point by a fortiori argument that if a mere animal was worthy of humane treatment, how much more so was a human being created as the image of God. Paul, in fact, cited this very text twice in making a plea for the support of those involved in Christian ministry (1 Cor 9:9–14; 1 Tim 5:17–18).” Eugene H. Merrill, Deuteronomy (NAC; Nashville: Broadman & Holman Publishers, 1994), 325 – 26. John Calvin, Commentary on the Epistles of Paul the Apostle to The Corinthians, vol. 1, in vol. 20 of Calvin’s Commentaries, trans. John Pringle (Edinburgh: 1843; reprint, Grand Rapids: Baker, 2005), 294. The echo of Malachi 1:11 in 1 Corinthians 1:2 suggests that the Corinthians are part of the fulfillment of God’s plan to be worshiped among all the Gentiles and that it is Paul’s ultimate purpose in writing to them to see them play their part in fulfilling this worldwide eschatological vision by glorifying God (see 6:20b and 10:31b). If Malachi’s purpose and message was intended to help his audience “come to terms, mentally, spiritually and ethically, with the non-appearance of the new eschatological beginning” which had been expected with the return from exile, Paul’s goal in 1 Corinthians is to get the Corinthians to come to terms, mentally, spiritually and ethically, with its appearance. It is this vision of God’s eschatological plan, and the Corinthians’ failure to act in a way that coheres with it, that governs Paul’s response to them in this letter. R. E. Ciampa, and B. S. Rosner. The First Letter to the Corinthians (Grand Rapids: Eerdmans, 2010), 57–58. Richard B. Hays, First Corinthians (Interpretation; Louisville: Westminster John Knox, 1997), 151. Ibid. Cf. Hays, Echoes of Scripture in the Letters of Paul (New Haven, CT: Yale University Press, 1989), 165–68. Anthony Thiselton, First Corinthians: A Shorter and Exegetical Commentary (Grand Rapids: Eerdmans, 2006), 139.